QE1 is the nickname given to the Federal Reserve's initial round of quantitative easing. That's when the Fed massively increased it standard open market operations. It purchased debt from its member banks. The debt was mortgage-backed securities, consumer loans, or Treasury bills, bonds, and notes. The Fed bought them through its trading desk at the New York Federal Reserve Bank. The Fed can buy as much debt as it wants, anytime it wants. Like all other central banks, it has the authority to create credit out of thin air. It has this ability so it can quickly pump liquidity into the economy as needed. The QE1 program purchases lasted from December 2008 until March 2010. There were additional transactions made from April through August 2010 to facilitate the settlement of the initial purchases. The Fed launched QE1 on November 26, 2008. Fed Chairman Ben Bernanke announced an aggressive attack on the financial crisis of 2008. The Fed began buying $600 billion in mortgage-backed securities and $100 billion in other debt. QE supported the housing market that the subprime mortgage crisis had devastated. Fannie Mae and Freddie Mac guaranteed the securities. They are two agencies established by the government to boost the housing market. Fannie Mae buys mortgages from large retail banks while Freddie Mac buys them from smaller thrift ones. In December 2008, the Fed cut the fed funds rate and the discount rate to zero. The Fed even began paying interest to banks for their reserve requirements. At that point, all of the Fed's most important expansionary monetary policy tools had reached their limits. Therefore, quantitative easing became the central bank's primary tool to stop the crisis. By March 2009, the Fed's portfolio of securities had reached a record $1.75 trillion. Still, the central bank continued to expand QE1 to fight the worsening recession. It announced it would buy $750 billion more in mortgage-backed securities, $100 billion in Fannie and Freddie debt, and $300 billion of longer-term Treasurys over the next six months. By June 2010, the Fed's portfolio had expanded to an alarming $2.1 trillion. Bernanke halted further purchases since the economy had improved. The Fed's holdings started falling naturally as the debt matured. In fact, they were projected to drop to $1.7 trillion by 2012. 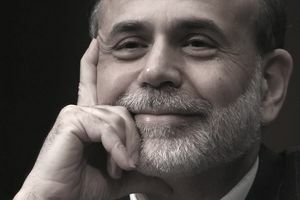 But by August, Bernanke hinted that the Fed might resume QE because the economy was still lackluster. Banks still weren't lending as much as the Fed had hoped. Instead, they were hoarding the cash. They were using it to write down the rest of the subprime mortgage debt they still had on their books. Others were increasing their capital ratios, just in case. Many banks complained that there just weren't enough credit-worthy borrowers. Perhaps that was because banks had also raised their lending standards. For whatever reason, the Fed's QE1 program looked a lot like pushing a string. The Fed couldn't force banks to lend, so it just kept giving them incentives to do so. QE1 had some significant drawbacks, but it did work overall. The first problem, as mentioned, was that it was not effective in forcing banks to lend. If the $1 trillion or so that the Fed had pumped into banks had been loaned out, it would have boosted the economy by $10 trillion. Unfortunately, the Fed didn't have the authority to make the banks lend it, and so it didn't work as anticipated. A bank only has to keep 10% of its total assets in reserve. That's known as the reserve requirement. It can lend the rest, which then gets deposited in other banks. They only keep 10% in reserve, lending the rest. That's how $1 trillion in Fed credit can become $10 trillion in economic growth. QE1 led to the second problem. The Fed now had a record-high level of potentially dangerous assets on its balance sheet. Some experts became concerned that the Fed had absorbed the subprime mortgage crisis. They worried that the massive amount of toxic loans might cripple it like they did the banks. But the Fed has an unlimited ability to create cash to cover any toxic debt. It was able to sit on the debt until the housing market had recovered. At that point, those "bad" loans became good. They had enough collateral to support them. That, of course, led to the third problem with quantitative easing. At some point, it could create inflation or even hyperinflation. The more dollars the Fed creates, the less valuable existing dollars are. Over time, this lowers the value of all dollars, which then buys less. The result is inflation. But the Fed was trying to create a mild inflation. That's because it was counteracting deflation in housing, where prices had plummeted 30% from their peak in 2006. The Fed was dealing with the immediate crisis. It wasn't worried about inflation. Why? Because inflation doesn't occur until the economy is thriving. That's a problem the Fed would welcome. At that time, the assets on the Fed's books would have increased in value as well. The Fed would have no problem selling them. Selling assets would also reduce the money supply and cool off any inflation. That's why QE1 was a success. It lowered interest rates almost a full percentage point. Rates fell from 6.33% in November 2011 to 5.23% in March 2010 for a 30-year fixed interest mortgage. These low rates kept the housing market on life support. They also pushed investors into alternatives. Unfortunately, sometimes this included runs on oil and gold, shooting prices sky-high. But, record-low interest rates provided the lubrication needed to get the American economic engine cranking again. What Was QE2 and Did It Work? What Was "Operation Twist" and How Did It Work? Why Do Interest Rates Ever Need to Rise? How Much Money Is There in the United States?